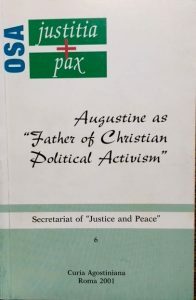 Augustine was born in Tagaste, in North Africa, in the year 354. He received a Christian education thanks to Monica, his devout mother, but left the faith as a young adult. In Italy, he studied philosophy and rhetoric, and at one time joined the Manichean sect. At the age of 33, he converted to Christianity, drawn back to the faith by the preaching of St. Ambrose, then bishop of Milan. 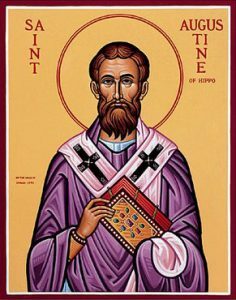 Augustine’s education in philosophy served him well as a priest and bishop (of Hippo, in North Africa). He remains one of the most prolific writers of the Catholic Church; his works include sermons (of which more than 400 survive), refutations of heresies, his Confessions and theological masterpieces such as City of God, On the Holy Trinity, and The Enchiridion. Although the Order of St. Augustine was not founded until 1244, he also wrote a rule prescribing a way of life for men and women who desire to live in a religious community. This guide is now known as the Rule of St. Augustine. Augustine died in 430 in Hippo. Augustinian friars, sisters, and their lay associates work with the poor, the hungry, the uneducated, refugees, and others in need. 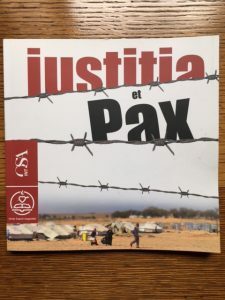 Their efforts are inspired and encouraged by St. Augustine’s many writings and sermons on justice, peace, poverty and wealth. hungry, and you could give it to no one. You clothe a naked person.